20 Different Colors + 19 Different Modes On 1 Super Strong Whip! 5150 Whips was started by life long off-roaders to create the strongest, brightest, most versatile, and easiest to mount multicolored lighted LED Whips in the industry. After being tired of replacing the traditional one color plastic straw whips once a season, 5150 whips was born to outlast and outshine the competition. 5150 Whips feature a wireless remote control that adds fun and makes changing the colors and programs easy. These durable multicolor lighted whips also come with safety flags for use in riding areas that require the use of a safety flag. Uses include: Side by Sides, Rhinos, RZR's, UTV's, ATV's, Jeeps, Quads, and Buggies. 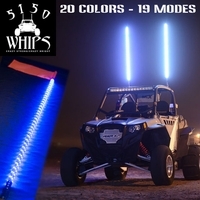 5150 LED whips feature 20 different colors and 19 different programs which allow you to control color, speed, brightness and select preset light shows. This combined with the fastest quick release system in the industry making a 5150 whip an awesome addition to your ride. 5150 Whips has tested their products from tight trails to big sand dunes and everything in between. Their patent pending quick release system is a true quick release and requires no tools to remove/switch between day and night whips. Unlike other companies, our quick release system comes with your purchase along with an in-line fuse and wire plug pigtail. 5150 Whips only uses water proof large 5050 LED's while some of the competition uses smaller LED's to save cost. Their 4 foot whips contain approximately 200 LED's and their 6 footers have 300 LED's. Unlike their competitors who loosely wrap their LED's (like a candy cane) 5150 closely wrap theirs to give you the most LED's per linear foot of whip. This makes 5150 whips the brightest around. So when you are ready for the strongest and brightest whips on the market look no further than 5150Whips. Going with anything else would just be crazy. 5150WHIPS - "CRAZY STRONG, CRAZY BRIGHT!"